Mother Jones was born Mary Harris in Cork, Ireland, in 1836. As a child, she immigrated to North America with her family to escape the Irish famine. In her early 20s, she moved to Chicago, where she worked as a dressmaker, and then to Memphis, Tenn., where she met and married George Jones, a skilled iron molder and staunch unionist. There tragedy struck. A yellow fever epidemic in 1867 took the lives of Mary’s husband and all four of her children. Mary lost everything in the Great Chicago Fire of 1871. After the fire, Mary began to travel across the country. In Kansas City, she did advance work for a group of unemployed men who marched on Washington, D.C., to demand jobs. In Birmingham, Ala., she helped Black and white miners during a nationwide coal strike. In June 1897, at the railway union convention, she began to be referred to as “Mother.” The name stuck. 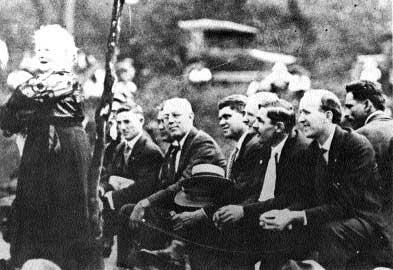 That summer, when the 9,000-member United Mine Workers called a nationwide strike of bituminous (soft coal) miners and tens of thousands of miners laid down their tools, Mary arrived in Pittsburgh to assist them. She agitated in the anthracite fields of eastern Pennsylvania, the company towns of West Virginia and the harsh coal camps of Colorado. She was banished from more towns and was held incommunicado in more jails in more states than any other union leader of the time. Mother Jones was deeply affected by the “machine-gun massacre” in Ludlow, Colo., when National Guardsmen raided a tent colony of striking miners and their families, killing 20 people — mostly women and children. She traveled across the country, telling the story, and testified before the U.S. Congress. In her 80s, Mother Jones settled down near Washington, D.C., in 1921, but continued to travel across the country. Unable even to hold a pen in her fingers, in 1924 she made her last strike appearance in Chicago in support of striking dressmakers. She died in 1930 and was buried in the Union Miners Cemetery in Mount Olive, Ill.
Reprinted with permission of Working Women network, which you can join at . Editor’s note: For years, Mother Jones was on the staff of the Socialist Party as a speaker and organizer. To her last breath, she fought the capitalist system and worked for a socialist USA.